The Free Library’s map collection comprises thousands of maps focused on the development and history of Philadelphia and Pennsylvania. One particular map, the Plan of the City of Philadelphia and Environs, 1809, surveyed by John Hills in the summer of 1801, 2, 3, 4, 5, 6, & 7, depicts an unusual circular map that is large in size (approximately three by three feet) and has numerous visual details, making it a compelling example of nineteenth century mapmaking. 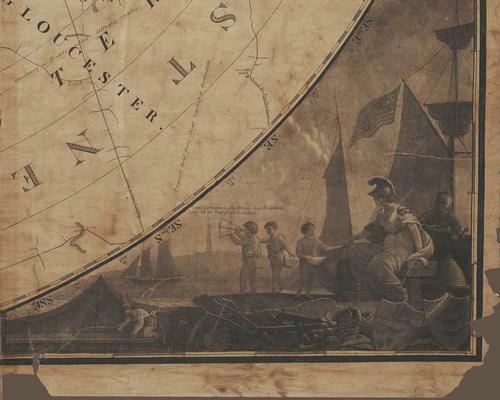 Mapmaking flourished in the years leading up to and during the American Revolution due to the military and naval surveyors who were among the British forces throughout the French and Indian and Revolutionary Wars. 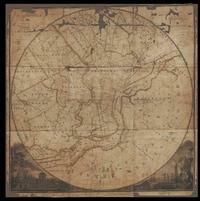 Mapmakers focused on producing maps of colonial cities that were critical to their military strategy. British surveyor, draughtsman, and assistant engineer John Hills created many hand-drawn maps throughout much of the Revolutionary War. After being discharged from the British Army in 1784, he moved to the United States, eventually settling in Philadelphia in 1786. 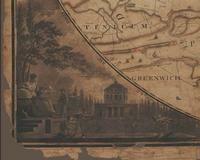 It was in Philadelphia that he put his surveyor and draughtsman training to work to produce this map. He surveyed Philadelphia and its surrounding areas for seven years, and it was another two years before the map was printed. Although Hill’s surveying efforts were significant and time-consuming, his map wouldn’t have circulated without the assistance of engraver William Kneass. Kneass was born in Lancaster, Pennsylvania, and was responsible for engraving the map onto metal plates (nine to be exact) that were then inked. From the inked plates maps were printed and ultimately sold. The map’s details, ornamentation, corner illustrations, and presumed accuracy (think: seven years of surveying), helped to make it more desirable (and thus sellable) in a commercial market. Intrigued buyers would have been tempted to purchase this map depicting Philadelphia and the ten-mile radius surrounding its center hub. The outskirts of the radius depict the less densely populated areas of New Jersey and Delaware, and on either side of Philadelphia are the "Manaiunk or Schuylkill River" and "Poutaxat or Delaware River." The legend (or key) of the map tells us that it identifies features, such as county lines, schools, taverns, mills, places of worship, as well as dozens of creeks and turnpike and carriage roads. At the center of the map (from which the radius emanates) is the "pump house" (now City Hall) on Broad and Market Streets. In the bottom left corner of the map, we see an illustration of the "pump house" (referred to as "The Hydrant" in the image). The pump house was designed by Benjamin Latrobe, and completed in 1801 in a neoclassical style. Water from the Schuylkill River was carried to it in hollowed-out logs running under Chestnut Street. (Some of these logs were just discovered under Spruce and 9th Streets!) It was the city’s first major water pumping project, but after years of issues with engine failures, insufficient reservoirs, and seeping logs, the city supplanted it with a water pumping and reservoir system on Fair Mount. The illustration also depicts a woman leaning on a globe and directing several cherub-like figures who wield surveyor’s tools. The woman is either a muse of cartography (mapmaking), or perhaps the figure of Peace from the City of Philadelphia’s official seal. In the eighteenth century, Peace was depicted as holding a scroll depicting William Penn’s plan of Philadelphia. It’s not a stretch of the imagination to envision her here, directing the figures to survey the land and ultimately create a map of Philadelphia. Her companion, in the opposite corner of the map, holds a scroll—perhaps this is the finished map? 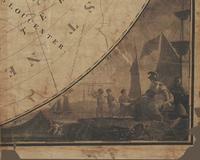 In the bottom right corner of the map, we see the lighthouse from Cape Henlopen, as well as several cherub-like figures, another female figure, and a Native American man. Cape Henlopen provided entrance from the Atlantic Ocean to the ports of Wilmington, Delaware and Philadelphia, and served to increase trade. By the mid-18th century, trade was so vital to the Delaware Bay that a public lottery was held to build a permanent lighthouse on the Cape and secure the safety of passing ships. The female figure is possibly Plenty, the second figure depicted on the Philadelphia city seal. On the seal, she holds a cornucopia. In the corner illustration, you can see that there is a cornucopia near her feet and that she’s surrounded by crops. On the other hand, perhaps she’s Columbia, the female personification of the United States, as she is wearing a hat (Columbia is typically depicted in a Phrygian cap) and the American flag is flying above her. Or perhaps it’s Athena, the goddess of wisdom, war, and patron of sailors. Near her are two shields: the one on the left is the coat of arms of Philadelphia, while the shield on the right is the coat of arms of New Jersey. Near the female figure is a Native American man smoking a pipe. He’s perhaps a part of the Lenni Lenape or Susquehanna community. His inclusion is rather ambiguous and may suggest his role as a native inhabitant of the land, his involvement with trade among settlers, his role as a warrior or guide to the female figure, or may reflect the European exoticization of other cultures for commercial interest. This map provides an interesting interpretation of Philadelphia’s history through the lens of a British cartographer. It allows us to see how Philadelphia has changed in terms of population density, infrastructure, geographic features, and place names. If you’d like to make an appointment to see this map (or any other map) in person, email erefmap@freelibrary.org or call 215-686-5397. A big thanks to John H. for the numerous, informative conversations, as well as Chris B. for his visual insight! Over the past few weeks, the staff of the Special Collections Division of the Free Library of Philadelphia has been writing about items from their collections that relate in some way to Philadelphia. This is a very enjoyable essay to read. Can you tell me the various 'states' of this map? I'm afraid we haven't any information on the various states of the map.